The Leopard I was the first real Main Battle Tank build by (West)-Germany after the second world war. Development started in 1956 and the first production vehicle was completed in 1965. 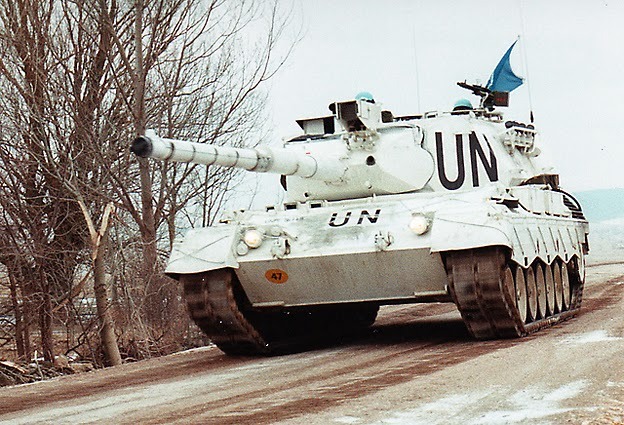 There are basically 5 versions of the main battle tank version, small differences between country specific versions not included. The biggest differences between the A1/A2 and A3/A4 is the turret shape. the A1/A2 have a round turret while the A3/A4 versions have are boxshaped turret. Other differences are in the electronics, sighting systems etc. The A5 version is a result of a more thorough modernisation program in the '80's. 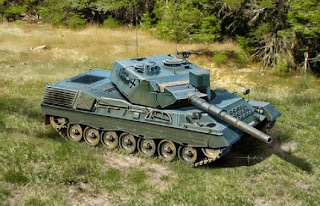 All versions are armed with the British 105mm Royal Ordnance L7A3 L/52 rifled gun. The leopard I was used by more then a dozen countries from mainly Europe and South-America. Other versions of the leopard I include the anti-aircraft or FLaK version 'Grepard', a bridgelayer system 'beaver' and an engineering/recovery version. 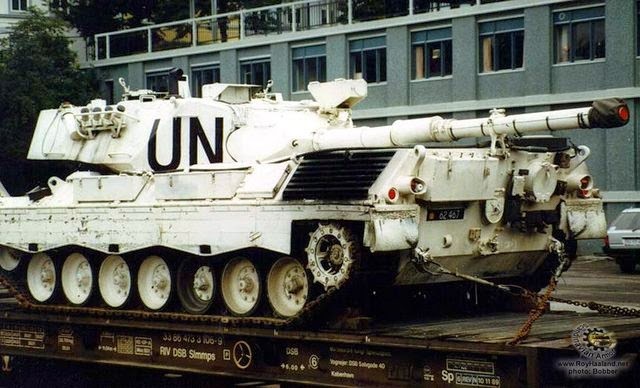 UN PROFOR was the UN peace keeping force in the Balkans during the conflict there in the '90s. The Danish army was stationed there as well as a part of Norbat 2, the Scandinavian contribution to the mission. 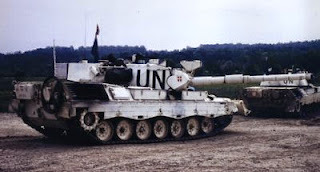 On April 29th 7 Leopard 1A5DK tanks where ordered to relief an observation post that was shelled for the 28th time. When they arrived they where engaged by Serbian forces. 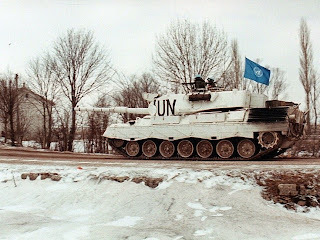 Initially a small drawback in a more protected area was ordered but as the attacks on the tanks continued and airsupport was denied the tank commander decided to engage the enemy forces. In total 72 shells where fired wrecking havoc on the Serbian positions. 5 tanks and the personel of the observation post where able to get back the same day, the 2 other tanks took few days longer to reach the home base again. More on this mission can be read here and here. Since there is no Leopard I A5DK model available in 1/72 I build these modifications myself. Also I removed some recesses from the turret which don't seems to be there on the real vehicle (at least not so prominent) and replaced the bars around the smoke dischargers as well. The detail of the Italeri model is comparable with the detail in the Revell model but the fit is not so good. In the front of the upper hull there is a pin designed to fit in a slot in the lower hull. These can best be removed since they don't fit in each other and prevent a good connection between the lower and upper hull. 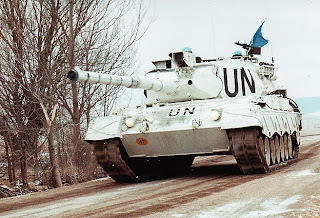 I painted my as a UN vehicle so it was 100% white except for the tracks and rubber wheel rims. I painted the sides of the hull black, on the real vehicle these will be white no doubt but that can't be seen due to the shadows from the side skirts. To mimic this effect I painted the sides of the hull black. 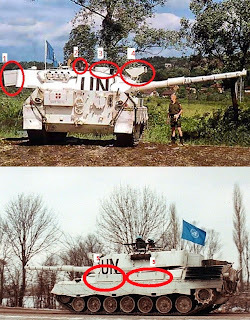 I could have done a better job painting the markings though. Italeri's model is a good model when it comes to the detail but the fit of the parts could be a bit better. An omission on this model is the lack of guide teeth on the middle of the innersurface of the tracks. All in all it isn't a bad model though. item number 4. is not "more advanced optics" , but a high powered spotlight (350W/500W) (spread/focused), at 500W/focused it can shine up to 1000 meters away.